Today is horrendously hot, and the next two days threaten to be worse. I have therefore spent the afternoon… cooking. No, really, bear with me, it isn’t as mad as it sounds. Cooking in this weather can only be described as a penance, but one can’t have takeaway every night (or at least, I can’t). So I have a strategy for these hot days, though I admit it works better when I am organised enough to get started on it before the weather really heats up. Basically, on the first day, I buy bread and cold meat, and I make a tomato salad, baked ricotta, and roast a lot of garlic (which I set aside), capsicums, eggplant, and any other vegetables which take my fancy. We eat these at room temperature. The next day, we have more bread, baked ricotta, and the roasted vegetables and garlic get mixed in with tinned chickpeas and herbs and maybe tomato to make a salad. I’ll usually make a cucumber salad, carrot or beetroot salad or similar – basically a salad which is happy in the fridge for a few days. The day after that, we have the last of the roast vegetable salad, leftover vegetable salad, and the bread gets grilled and added to a fattoush-style salad. And we still have baked ricotta, or if we don’t, I buy some nice cheese. And so forth – the idea is that I only have to cook a maximum of one item per day, and if possible I do it in the morning, before things heat up too much – the rest of dinner is just a matter of assembling things that are either raw or have already been cooked. But one still has a reasonably healthy and varied diet and doesn’t wind up eating the same food each day. Sometimes I’ll mix things up by marinating lamb or chicken for kebabs the night before, or making felafel to cook right before dinner, but basically it’s bread, salad and cheese all the way until the cool change which, Melbourne being what it is, is usually only a few days away, and thank goodness for that. This is so very easy. 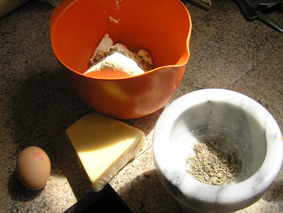 Basically, you put your ricotta, egg, parmesan, herbs and seasonings in a bowl and beat them together until well combined. 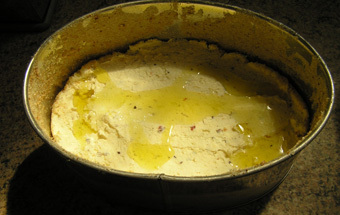 Then you get a small baking tin and pour in a little olive oil, which you use to cover the bottom and sides. 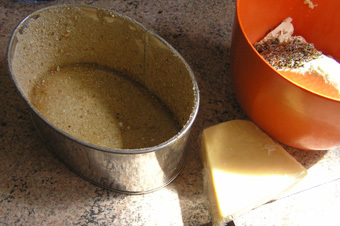 Pour in some breadcrumbs and tilt the tin around until the sides are covered with a layer of crumbs – tip out the excess. Put the ricotta mixture into the tin and press down well. Drizzle a little more olive oil over the top, and bake for an hour or so at 180°C – what you are looking for is for the ricotta to puff right up, but to feel a bit springy when you press it with your finger. If it still feels soft and doesn’t provide any resistance, it isn’t done yet. It will collapse down again once it’s out of the oven, but that’s fine. Turn it out onto a plate and then reverse it back onto another plate so that it is the right way up. I usually cool it a little at room temperature and then put it in the fridge to finish cooling down. It’s actually nicest at room temperature, but I don’t trust it to stay food-safe at room temperature in hot weather. Serve with bread and tomatoes for a hot summer dinner. You can use any herbs or spices you like. It might be nice with dried chilli, thyme and sun dried tomatoes chopped and stirred through it. 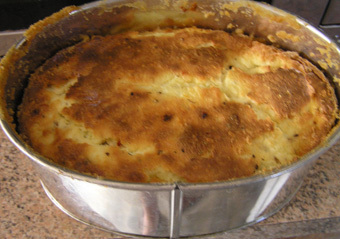 To make it gluten-free, you can use polenta (cornmeal) or almond meal to line the tin, instead of breadcrumbs. This is obviously not a recipe which can become dairy-free, and I really think it needs the egg to work, though if you have an allergy to yolk rather than white, you could substitute two egg-whites for the whole egg.